We have been looking at a few of the add on hardware devices showing up for the iPad. They can be playing games, gathering mechanical data and even your blood pressure. 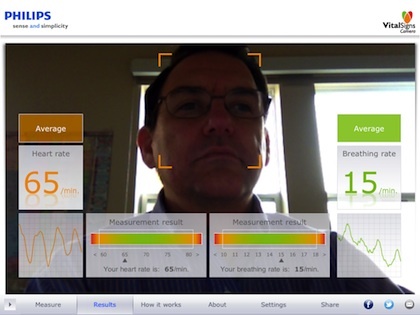 Today we where introduced to a tool from Philips to show you your vital signs without the need of any external hardware. When you have the data, you can share it out via an email, or share with friends and family on Facebook and Twitter. There is also the option to save the results screen to your iPad’s photo library. Magic? No, it is your iPad2 camera watching you with a bit of help from Philip’s computers. The Philips app watches for face color changes that are a result of your heartbeat… too small of color changes than a person can see with their naked eye. 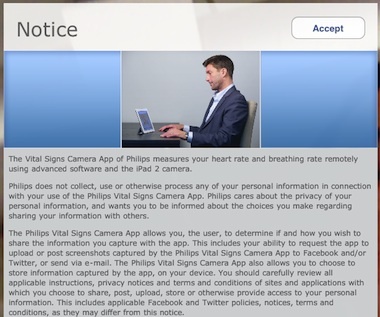 For the breathing, the Philips app can see your chest move to make it’s measurements from. We didn’t know that at first so we tried to control our breathing through our nose… just our usual fun and testing of software. We have included the Philips disclosure here since you can’t see it till you purchase. The ‘release’ aside, this is quite an achievement in the collection and management of data. We will be watching for other ways people might be thinking of watching things with the iPad2 camera and then crunch the data on supporting servers.